When it comes to working with CSS files in your theme, it makes sense to split up styles into separate files based on certain criteria rather than having one super file. This helps organize things which makes it easier to find what you're looking for later on and it also helps themers as they begin to adjust the look of a theme, know where they can go. And if you're careful, you can put certain styles in a particular style sheet that include styles that can be changed without causing major havoc on the theme. So for example, taking CSS styles that have something to do with the layout of the theme and separating that out into a separate file, but then other folks don't need to touch in order to adjust the look of the theme. 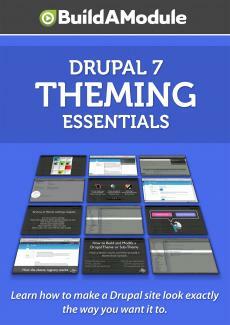 And what I'm going to do here is go through the different types of style sheets that you may use in your theme and explain what each one of them is for, and then we'll go ahead and look at some examples in the core Drupal themes as well as a few popular contributed themes. So first of all, we have our layout dot css file. This includes styles that have something to do with the positioning of elements on the site in particular the large elements so regions and blocks. The layout is where you would find the positioning styles for the sidebars, the footer and the header, as well as positioning for menu structures. For the most part, everything that has to do with the look and feel of the site goes into the style dot css. This is kind of the catchall. Anything that doesn't end up in the specific style sheets around it typically will end up in style dot css. Print dot css is a specific style sheet that gets pulled in whenever somebody goes to print a page in Drupal. So when you go to the print option, it will automatically load in the print style sheet and that will allow you to override or specify specific layout instructions for that page and specific high contrast colors, for example. So that print style sheet can be very important if your application or your website has very print specific needs. A lot of themes come with a local dot css file which can be copied into a subtheme folder and adjusted.